We were gifted with zucchini from a couple of people this year, and we were able to make several yummy items with them. This rice dish is dirt simple and tasty. It's an easy way to get in an extra bit of veggie, too. Heat the EVOO in a sauce pan over medium heat. Add the rice and stir. Toast the rice for a few minutes. Pour in the chicken broth. Bring to a boil, turn heat to low and cover. Cook, covered, for about 15 to 20 minutes or until the liquid has absorbed into the rice. 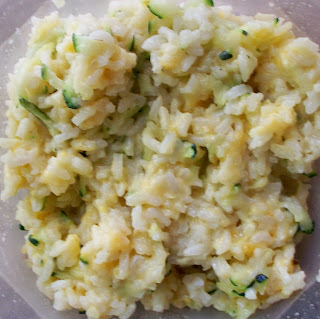 Remove from heat and add cheese, zucchini, butter, pepper and garlic powder. Stir until well mixed, then let sit for 5 minutes.